When you start developing for mobile, you tend to find reasons for harnessing the device features that they come with (camera, location services). If you've ever had the need to snap a photo from Salesforce1 and attach it to a record(in a custom VisualForce page of course), you may have come across the wonderful tag <apex:InputFile />. It's a definite time-saver versus having to handle the complexities of file formats, sizes, viewstate, governor limits etc. This means that any other part of the page that attempts one of these actions will not be able to do so, simply because the page contains an InputFile tag elsewhere. I quickly found this solution (using an ActionRegion tag to wrap other parts of the page) that worked initially but as my page grew, the InputFile component broke. The component stopped firing the setter for my Attachment property. The more I worked with trial and error, I decided to cut my losses and encapsulate it within an iframe so that I could code with freedom on the main page. Attachment page: Create a page that takes an ID as a url parameter for the ParentId, to be used to insert the attachment. In this page you have the InputFile tag which handles the file. The demo site was built for Salesforce1 and is a great example of using Bootstrap SF1 Theme along with the standard Bootstrap Javsascript library (matching the version to 3.0.1). The demo is responsive and works in the Salesforce1 app on mobile devices, desktop, and Salesforce1 through the browser. Implement swipe for the Details and Attachments tabs, and convert to "tap" instead of "onclick" events. Best Practice: Use JS remoting and remove the view state for better mobile performance. 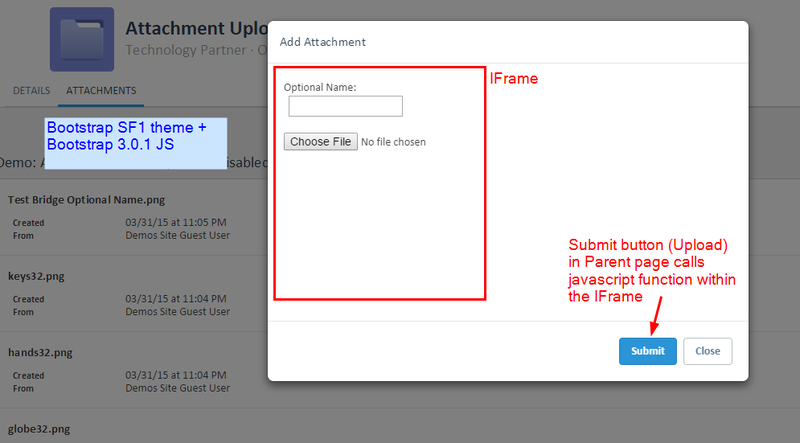 Implementing remoting on the parent page could be done with this iframe solution being handy. Contains an IFrame with id = "attachmentIFrame"
Contains a close button which is unlimited and able to call an actionFunction which does contain an oncomplete rule (which navigates the user to the attachments tab list). Contains page accessible method "ProcessAttachment" which will take the attachment property and perform the DML insert. Salesforce1 navigation vs desktop navigation are different, see this JS function than helps to handle this (used here when clicking on a link to the attachment). When the user clicks the Close button after they uploaded the attachment(s), we are able to show the Bootstrap tab very easily. By separating the inputFile tag, you can use rerender or oncomplete attributes on the parentpage again, without the need for actionRegion tags or multiple Form tags.